3:34 De Maxx - Long Player 26 [Drum 'n' Bass Edition] La Musique Fait La Force / N.E.W.S. Man könnte meinen, zwei up'n'comin' Talente aus UK machen zusammen eine sehr gute Single - muß nich sein - interessant allemal - leichter-flotter Groove, die niedliche Aluna-Stimme darauf - das war's dann aber auch schon. Klingt ganz cool, hinterlässt aber keinen wirklich bleibenden Eindruck bei mir. I didn't automa-ically like this but I do now. It sounds fresh and flows well, though it isn't as good as..."F For You". Van Disclosure gaan we nog veel horen. Toppers in het dancegenre. 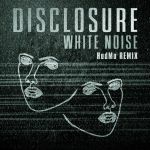 Fantastische singel Van Disclosure. Na enkele leusterbeurten hoor ik hem nog liever dan Latch! Een toppertje en hopelijk een dikke hit in wording! Pretty simple and boring. Still a bit catchy.<br><br>Edit: well it grew on me rather quickly. Addictive. Sounds ok but not the type of dance song i like. UK#2. It's fine, but I can't and don't love it. 'Latch' was a tad better, but it's still a cool track. Cooles, minimalistisches UK-Electro-Teil. Eingängige Bassline. I Love it! Also prefer Latch, but this is not bad at all. Un morceau que j'aime de plus en plus. Quite catchy, also love the inclusion of AlunaGeorge. Slightly better than Latch. ▒ Just "White Noise" !!! Zwakke en saaie dansplaat van "Disclosure & AlunaGeorge" uit begin februari 2013 ☺!!! It's alright but can get irritating quite easily. I prefer Latch. Hier ben ik persoonlijk niet echt weg van. Niettegestaande wel een hit geworden in Vlaanderen!! Voor de liefhebbers!! Knapp noch im grünen Bereich. The vocals were offputting at first, but something I became used to with more exposure to Aluna's voice. I still think this is an underwhelming follow up to "Latch" but it's not without its charms. Aluna's vocals have their lovely moments while I really enjoy the beat. Strong hook too. Pity it wasn't a UK #1, would've been cool to see Disclosure get one! Peaked at #68 in Australia, 2013. I really like this. Extremely catchy and the beat is really cool. Really love this, and IMO Aluna Francis' vocals really suit the tune. One of my favourite tracks of 2013 so far. Amazing. The beats are so addictive and Aluna's vocals are excellent here. Great that it got to #2 in the UK. http://www2.pictures.zimbio.com/gi/Aluna+Francis+Red+Carpet+Arrivals+NME+Awards+9yyqiB-s6gRl.jpg<;br><br>Dann runden wir halt mal fürs Aluna-Kind auf. Gefällt mir nicht. Ein bisschen überproduziert (wie viel Geräusche packen wir in eine Song.) <br>Das Tempo ist mir ein wenig zu hoch, es wirkt hektisch.